Nearly 50 million kids play organized sports each year, and each of them has a supportive family that digs deep into its pockets to pay for the essentials-uniforms, equipment, league fees, travel to away games. But the buck doesn’t stop there. With private lessons, elite sports camps, corporate-sponsored tournaments, and all the hotel expenses and tourist traps that come with them, youth sports is more than just a fun pastime. It’s an incredibly profitable market, and it’s become crowded with companies and individuals eager to reap the rewards. Building on his eye-opening investigation into the damaging effects of the ultra-competitive culture of youth sports in his first book, Until It Hurts, sports dad and journalist Mark Hyman takes us behind the scenes for a startling look at the business of youth sports, how it has changed, and how it is affecting young Americans. 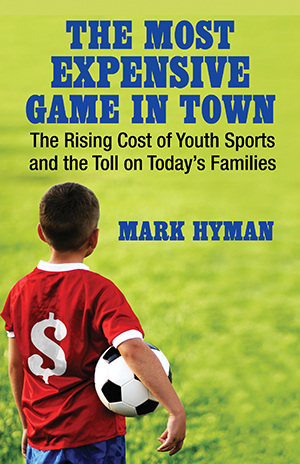 Examining the youth sports economy from many sides-the major corporations, small entrepreneurs, coaches, parents, and, of course, kids-Hyman probes the reasons for rapid changes in what gets bought and sold in this lucrative marketplace. He takes us to tournaments sponsored by Nike, Gatorade, and other big businesses. He talks to parents who sacrifice their vacations and savings to get their (sometimes reluctant) junior stars to these far-off, expensive venues for a chance to shine. And he introduces us to videos purporting to teach six-month-old babies to kick a ball, to professional athletes who will “coach” an eight-year-old for a hefty fee, to a town that has literally staked its future on preteen sports. However, the story isn’t all big business and bad guys. Hyman also turns the spotlight on individuals cashing in on the youth sports market, but whose goods actually provide (at least) some benefits to kids. Through extensive interviews and original reporting, The Most Expensive Game in Town looks beyond the high-energy ad campaigns, the supposedly performance-enhancing sneakers, and the cute baby-sized jerseys to explain the causes and effects of the commercialization of youth sports-and to reveal how these changes are distorting and diminishing family life. The proof is in the price tag. Happily, Hyman unearths promising examples of individuals and communities bucking this destructive trend and using youth sports to uplift and enrich kids’ lives, rather than to fill their own pockets.